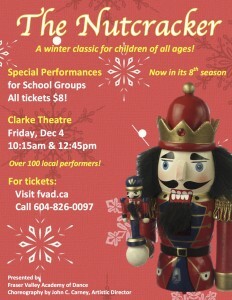 Fraser Valley Academy of Dance is offering two special performances of the Nutcracker on Friday, December 4th, 2015, at the Clarke Theatre for school groups. Looking for tickets for Saturday, Dec 5? Visit our Nutcracker Events Listing. Fraser Valley Academy of Dance with Artistic Director John C. Carney returns to the Clarke Theatre in December to present The Nutcracker ballet for its eighth season. Over 120 dancers will share the stage with professional guest artists. Join the Stahlbaums’ festive party, then witness the battle between Soldiers and Rats. Travel through the Snow and across the Ocean with Clara, Fritz and Drosselmeyer to the Kingdom of Sweets where they meet the Nutcracker Prince and the Sugar Plum Fairy. Everyone will enjoy the magic of this traditional winter classic! All seats are $8 for students and accompanying teachers. Wheelchair and companion seating is free of charge. Payment is due prior to the performance. Seats will be held as long as possible until payment is received. However, should another school provide payment for seats in the meantime, and no other seats are available, it won’t be possible to continue to hold seats. Home-school groups are welcome. Please follow the instructions below. Please book through your home-school office. Ask your home-school office to contact their families to find out who would like to attend. As the performances aim to maximize children’s exposure to live theatre, kindly ensure that there is only one adult per family in attendance. The home-school office should submit the Nutcracker School Booking Form to FVAD, with a list of names of those attending, noting Adult or Child for each. We will send the invoice back to the home-school office for payment. There are no actual tickets sold for these performances, so we are not able to sell to individuals. We look forward to sharing the Nutcracker with our area school students again this year!